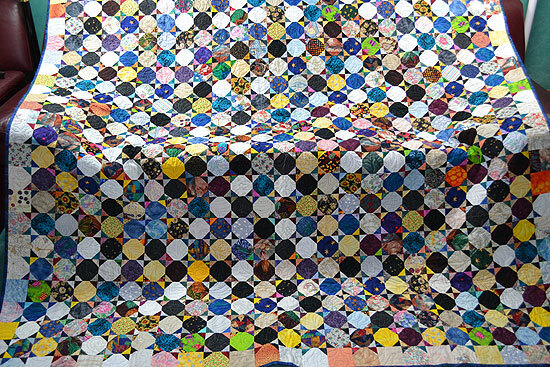 I started this quilt not long after I took my beginning quilt lessons. I had joined the Quiltsitter’s Club of a local quilt shop here, Quilter’s Cabin (now closed). At one of the monthly evening get-togethers, they handed out a pattern called Chinese Coins, which was a Quilt Sitter’s Circle pattern. Since this was early in my quilting addiction, I was gung ho for anything and thought it shouldn’t take long as it was a simple enough snowball block comprised of 4” cut squares with 1.75” cut connector corner squares. You sewed the dark connector corners on the light 4” squares, and the light connector corners on the dark 4” squares. Alternate them in your layout, and make the borders out of only lights with two dark connectors. Apparently, it was a design from an antique Massachusetts quilt (or so the handout read). Perfect for using up all those scraps! Well, I was such a newbie at this hobby, that I didn’t really have a lot of scraps. So a friend at the time was thrilled to offload hers. That should have been my first hint. After washing and ironing all the little scraps, I spent months (possibly years) of guild meetings cutting squares and sewing them together. Not wanting to disappoint any scraps by not including them, this project grew and grew until the bin was depleted and the top measured 87″ X 101″. Other projects came and went and, finally, on April 26, 2012, it was finished. 16 years after it was started. Yes, only 16 years!! You see, scrap quilts are perfect for when you want to be frugal with fabric. But you can’t have it both ways. Frugal with fabric does not mean frugal with time. As Laura (who has known me through this entire quilt) says, “It is time you’ll never get back”. And to this I add, “So you better love the project if you are going to spend time on it”. When I finished it and laid it out, I asked my hubby what he thought. And that is my best memory of this quilt experience. It had probably been 30 years or so since Frank had come up with anything as poetic as this line. It became another lesson from this quilt: You’ve got to cherish moments like this when you get them, and not wait for the Hallmark brand to show up. 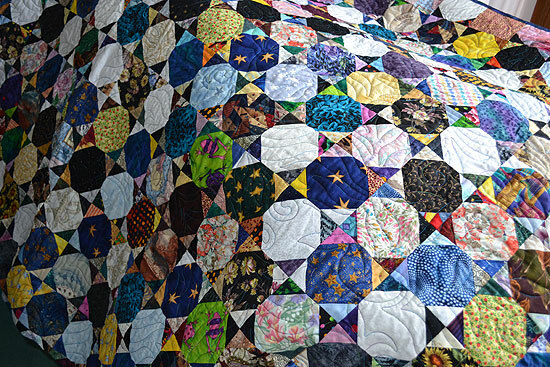 So on this Valentine’s Day I’ll pass on to you my learnings from this quilt and my hubby’s sweet musings. Last night at our Hockey Night in Canada Widows Club, one of our beginner students came in to get caught up on her homework. 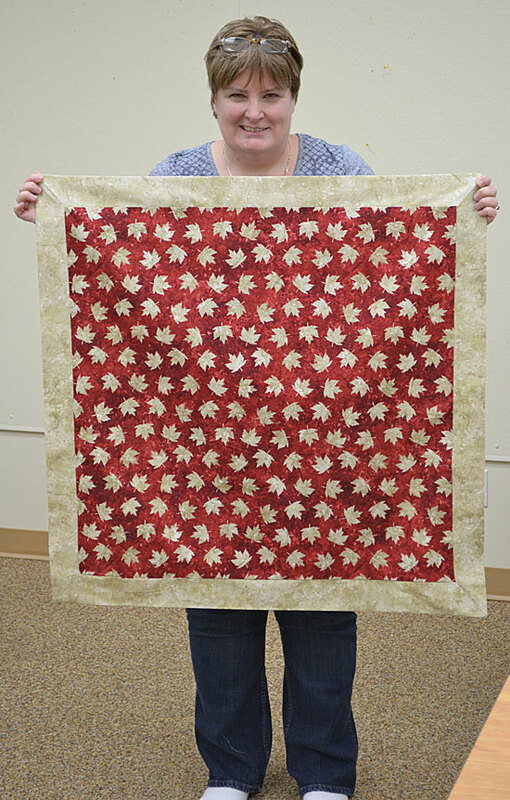 She asked if we knew of a quick table topper pattern she could get done in a couple of hours using some Canadian-themed fabric. A little thinking, and by the end of the night, not only did she have her homework caught up, she had a topper for her coffee table finished! Marlene Robanske waving her flag. Why the urgency? Well, this is Marlene Robanske, whose son, Chris Robanske, was headed for Sochi last night. He is one of our Canadian athletes who will be competing on February 17th in the Olympic snowboard cross events. Now Marlene will have a topper she can proudly display in case visitors come by for the big day. It doesn’t get much more exciting than that!